University refuses to ban guns in the audience despite a menacing email. Leah Hogsten | The Salt Lake Tribune Utah State University students and faculty rallied in support of feminist writer Anita Sarkeesian, who was supposed to address the campus until an author of an email threatened bloody mayhem on the campus if she was allowed to speak, Wednesday, October 15, 2014, outside the Glen Taggart Student Center on the campus of Utah State University. Sarkeesian cancelled her appearance on both the threat -- and a state law that allows conceal-carry permit holders to be armed at events in public venues. (Courtesy of Susanne Nilsson) An email to Utah State University threatened "the deadliest school shooting in American history" if the school did not cancel a lecture by a well-known feminist writer and video game critic Anita Sarkeesian. Leah Hogsten | The Salt Lake Tribune Utah State University students and faculty rallied in support of feminist writer Anita Sarkeesian, who was supposed to address the campus until an author of an email threatened bloody mayhem on the campus if she was allowed to speak, Wednesday, October 15, 2014, outside the Glen Taggart Student Center on the campus of Utah State University. Sarkeesian cancelled her appearance on both the threat -- and a state law that allows conceal-carry permit holders to be armed at events in public venues. Leah Hogsten | The Salt Lake Tribune Utah State University students and faculty rallied in support of feminist writer Anita Sarkeesian, who was supposed to address the campus until an author of an email threatened bloody mayhem on the campus if she was allowed to speak, Wednesday, October 15, 2014, outside the Glen Taggart Student Center on the campus of Utah State University. Sarkeesian cancelled her appearance on both the threat -- and a state law that allows conceal-carry permit holders to be armed at events in public venues. Leah Hogsten | The Salt Lake Tribune Utah State University students and faculty rallied in support of feminist writer Anita Sarkeesian, who was supposed to address the campus until an author of an email threatened bloody mayhem on the campus if she was allowed to speak, Wednesday, October 15, 2014, outside the Glen Taggart Student Center on the campus of Utah State University. Sarkeesian cancelled her appearance on both the threat ó and a state law that allows conceal-carry permit holders to be armed at events in public venues. 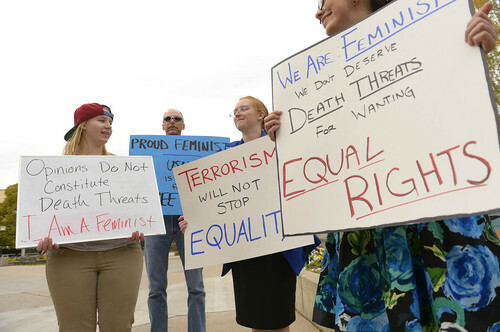 Leah Hogsten | The Salt Lake Tribune "I teach the relationships between people and animals," said USU professor Robert Schmidt (center) holding a "Proud Feminist" sign, "and the person who made these threats is the worst kind of animal." Schmidt is between students Emma Davis (left) and Kyra Lythgoe (right). 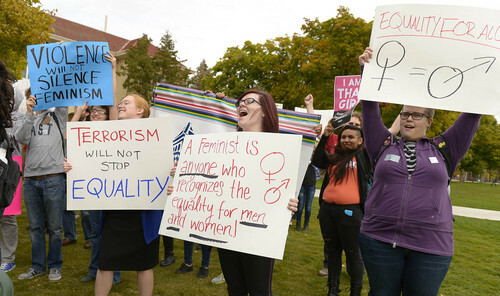 Utah State University students and faculty rallied in support of feminist writer Anita Sarkeesian, who was supposed to address the campus until an author of an email threatened bloody mayhem on the campus if she was allowed to speak, Wednesday, October 15, 2014, outside the Glen Taggart Student Center on the campus of Utah State University. Sarkeesian cancelled her appearance on both the threat -- and a state law that allows conceal-carry permit holders to be armed at events in public venues. 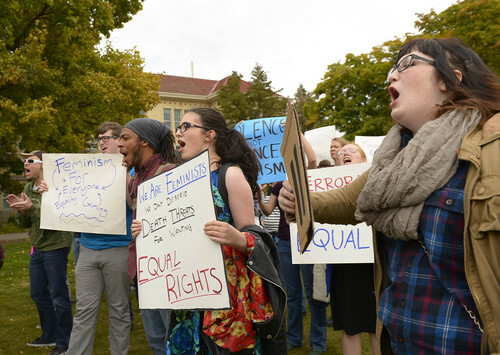 Leah Hogsten | The Salt Lake Tribune Asher Puriri, showing her support for Sarkeesian at the rally, said she believes that there is more misogyny and anti-feminist attitudes on campus than most realize. 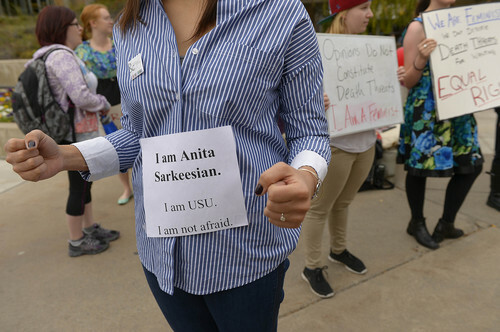 Utah State University students and faculty rallied in support of feminist writer Anita Sarkeesian, who was supposed to address the campus until an author of an email threatened bloody mayhem on the campus if she was allowed to speak, Wednesday, October 15, 2014, outside the Glen Taggart Student Center on the campus of Utah State University. Sarkeesian cancelled her appearance on both the threat -- and a state law that allows conceal-carry permit holders to be armed at events in public venues. 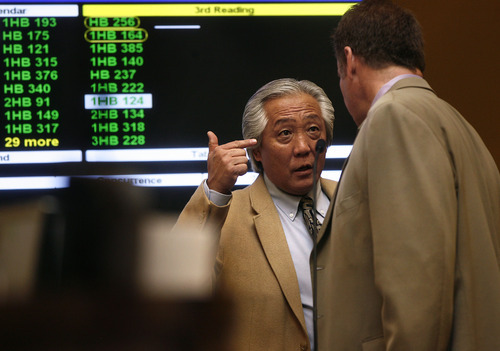 Scott Sommerdorf | The Salt Lake Tribune Just after HB76 - Concealed Weapon Carry Amendments - passed the Senate with 21 votes for, 4 against, Rep. Curt Oda, R-Clearfield, speaks with Sen. Mark Madsen, R-Eagle Mountain. Oda mentioned that he was happy with the 21 votes because it sent a message to the Gov. Gary Herbert about a potential veto. 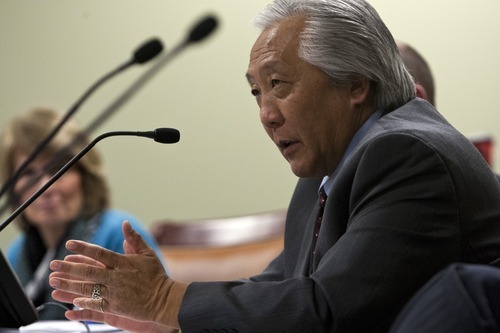 Chris Detrick | Tribune file photo Rep. Curtis Oda, R-Clearfield, is a staunch gun-rights supporter who doesn't believe gun-control laws do anything to curb violence. 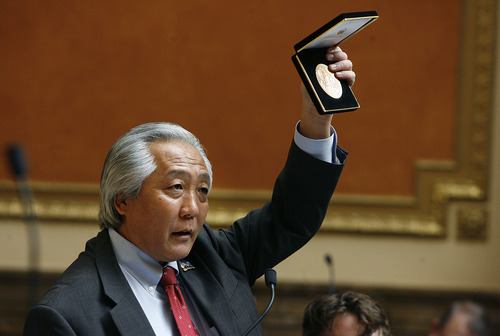 Scott Sommerdorf | The Salt Lake Tribune Rep. Curt Oda, R-Clearfield, holds aloft in the Utah House a replica of the Congressional Gold Medal that was officially presented to the 100th, the 442nd, and the MIS, including the Utah Nisei veterans, and their representatives by congressional leaders. 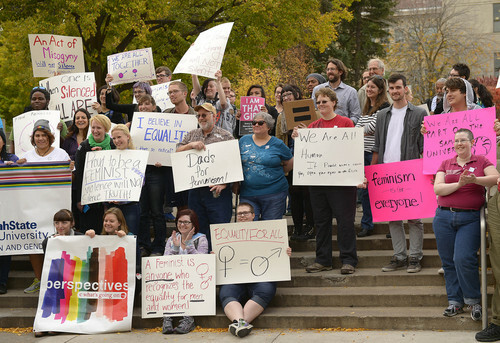 Logan • Utah State University students protested the cancellation of a feminist video game critic&apos;s speech Wednesday. But they don&apos;t blame video blogger Anita Sarkeesian for bowing out. Instead, they criticized the anonymous emailer who threatened their campus with mayhem. "This is an academic institution," said biology student Geoff Smith. "Without a free exchange of ideas, we don&apos;t have anything. So for that to be silenced or quashed or anything like that, it&apos;s wrong." 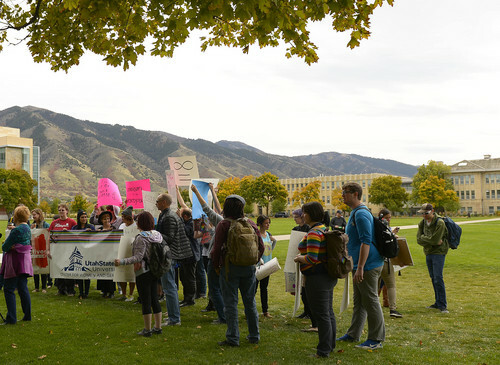 About 50 students and faculty members gathered Wednesday outside the Taggart Student Center to promote free speech and condemn the threats made against Sarkeesian. They chanted, "We will not be silenced." The feminist media critic called off a speech scheduled for Wednesday after USU received an anonymous email threatening to kill her and other feminists  apparently inspired by the 1989 "Montreal Massacre" in which 14 women were murdered  if the event were not canceled. When university officials told Sarkeesian they could not stop concealed-weapon permit carriers from packing their handguns into the room where she was going to speak, Sarkeesian called it off and left town. Backpacks would not have been allowed into the Taggert Student Center Auditorium, but Sarkeesian said USU declined to pat down students or post metal detectors at the doors. Threats are nothing new to Sarkeesian, who has been targeted by video gamers&apos; threats after critiquing the misogyny inherent in depictions of women in computer games. In fact, she proceeded with a speech at Seattle&apos;s Geek Girl Con despite being threatened over the weekend for that appearance. "To be clear," she tweeted late Tuesday night, "I didn&apos;t cancel my USU talk because of terrorist threats, I canceled because I didn&apos;t feel the security measures were adequate." 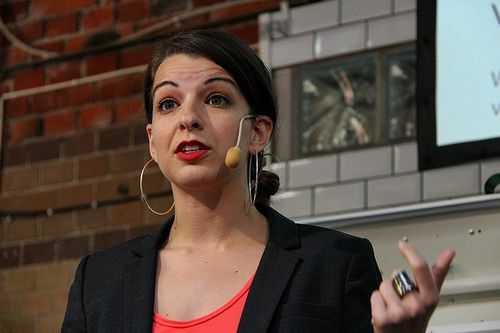 The university&apos;s Center for Women and Gender sponsored Sarkeesian&apos;s speech. Center Director Ann Berghout Austin said efforts were being made to reschedule with Sarkeesian so she could to speak to students remotely. "We&apos;re hoping we can get her back  not back on campus," Berghout Austin said. "We&apos;re hoping we can get a Skype lecture just as quick as we possibly can." USU spokesman Tim Vitale said campus law enforcement officials believed they had managed to create a "safe venue for her to talk." "We did not take the idea of canceling this event lightly and we, in fact, wanted to move forward with it," Vitale said. "She determined that safety factors were such that she didn&apos;t want to. "Threat, real or not, it&apos;s a sad state of affairs for the world of free speech." Sarkeesian hosts an online video series that challenges how women are portrayed in video games. She planned to speak about her latest installment of #TropesvsWomen called "Women Background Decoration: Part 2." She and other feminist critics of the victim/whore portrayals of women in video game culture have been targeted with hacking campaigns, threatened with sexual violence and had their photos and addresses posted online. At Wednesday&apos;s campus protest, students defended Sarkeesian&apos;s right to discuss her work without fear. "I don&apos;t agree with all her opinions," said Emma Davis, a junior in mechanical engineering, "but no one should ever be threatened for trying to say their opinion." Many USU students and alumni posting comments on a university website were sympathetic with Sarkeesian. "If she doesn&apos;t feel safe, then she doesn&apos;t have to do the speech," Jordan White wrote in a post on USU&apos;s Facebook page Wednesday, "and no one has a right to say her decision is wrong or second-guess it." And Chris Rogers posted: "It&apos;s absolutely BS that someone would find it necessary to threaten violence to silence dissenting opinion." Others were upset the speech was called off. Chief Johnson, a student lab instructor in the nursing department, believes the threat was just a hoax. He figures everyone overreacted. "Kids have concealed-carry permits every day of the week and twice on Sunday," Johnson said. "Whether you choose to admit it or not, people are carrying firearms. It&apos;s a state school. It&apos;s a Second Amendment right. And lots of kids exercise it." And Tim White posted: "Shouldn&apos;t give in. Just letting the guy behind the threat win." Berghout Austin said she was heartened by the students and faculty members who rallied in support of free speach. "They didn&apos;t even tell the center they were doing this," she said. "They just did it."